Into the mountains of Munduk – snackettes. As noted in our last few dispatches, we spent an amazing first week in the very traditional village of Sideman, where we witnessed our first Balinese ceremony and first human cremation, saw some impossibly beautiful rice terraces, and met some new friends. We knew that it would be hard for our next stop– or any stop after this, really– to live up to our time in Sideman. We set our sights on the tiny northern Balinese village of Munduk, known for its numerous hiking trails teeming with waterfalls and its fertile valleys that produce nearly every delicious fruit or spice grown on Bali: papayas, mangoes, bananas, rambuttan, strawberries, coffee, ginger, cocoa, palm sugar… How could it not be amazing? Indeed, we hiked to *another* breathtaking waterfall. Meh. …but the absolute BEST part about Munduk was the sweet little Balinese family, who took us into their sweet little guesthouse, and showed us a “sweet” side of Bali that we had been looking for all along but had still yet to see. It all started when our driver dropped us off in the middle of Munduk village, a tiny strip of a one-lane road lined with small concrete homes and dime-store markets, precariously perched on the ridge of a stunningly beautiful mountain range. 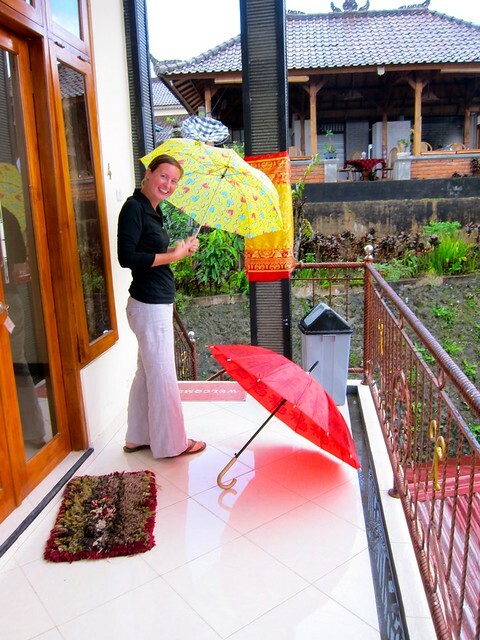 We hadn’t booked any hotel before arriving in Munduk, so we stopped to look at a guesthouse that we had read about in our guide book–it was just OK and a little overpriced– and then agreed to check out just one more place before deciding which place to stay. Within seconds of checking out the next place, called Aditya Homestay, a heavenly pure-strawberry juice smoothie (from strawberries picked that day, just down the hill) appeared in our hands. We had picked the right place. This theme followed throughout the rest of our stay: walking by the reception desk? Strawberry smoothie. Taking too long using the free internet downstairs? Strawberry smoothie. Peeking out the front door of the guestroom to see if it’s raining? Strawberry smoothie (with open umbrellas sitting outside the door if answer to previous question is “yes”). Back from a long hike? Free water and a surprise heaping plate of delicious Balinese gado gado (chicken and green beans in sweet peanut sauce) on our doorstep (…alongside strawberry smoothie, of course). 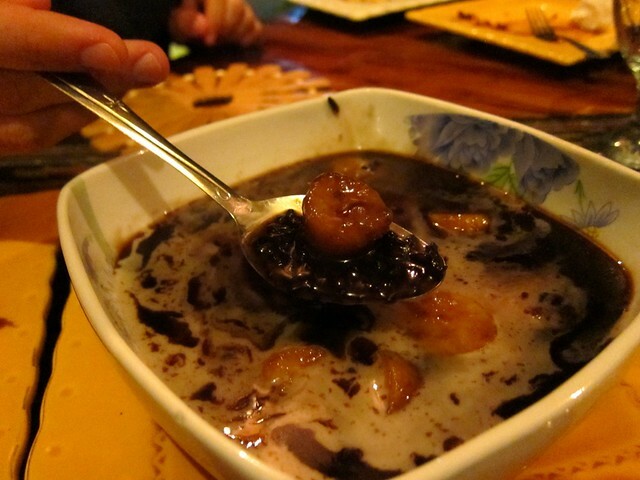 and ordered the most interesting-sounding dessert on the menu: Bubur Injin (black sticky rice with coconut milk and palm sugar). So the very next night, our host (and owner of Aditya), Elo, taught us how to make hand-ground Balinese “corn fritters”, “urab” (greens sautéed with garlic, shallots, and tossed with shredded coconut), sate ayam (savory chicken skewers with hand-ground peanut sauce), and deep-fried bananas and jack fruit covered in (more– always more) palm sugar. One day, Elo, Futu, and Maya invited us to join them at their family’s temple, an annual prayer gathering during which all Hindu Balinese pray for knowledge. Before meeting Elo and her family, Scott and I felt like we really didn’t “get” Balinese food; there were odd combinations of seeminlgy-familiar ingredients that never seemed to go together in quite the right way… Now I will say to anyone who wants to experience undeniably delicious, authentic Balinese food: walk out of the Denpasar Airport, catch a ride straight to Munduk, and on the far east edge of town, down a small side street on the left hand-side, watch for a tiny smiling woman waving something in her hand for you to try– your first real strawberry smoothie. What a wonderful experience! This whole trip is proving to be beyond amazing! Me and my girlfriend are planning a month-long trip to Indonesia at the moment. Did you have a preference between Sideman and Munduk in the end? How long did you spend in each place and would you do anything differently now that you know what the two places are like? I am so sorry I forgot to respond to this when the message came through… For what it’s worth for anyone else viewing this, I think we preferred Sideman for the scenery and the fact that it was still very underdeveloped (tourism-wise). We stayed about 5 days in each place. We may have just gotten lucky in Sideman because of our great host (who is no longer there) and the experiences that we had with his family’s ceremonies, but it is a very special place. Not sure what we’d have done differently! One thing I would do differently is to get a rabies shot before going to Bali! We got so many preparatory vaccines and that is one we did not get– but when we made it to within 100 yards of the largest banyan tree in the world and couldn’t get any closer because of a stupid growling dog, I wish I had had the rabies shot!